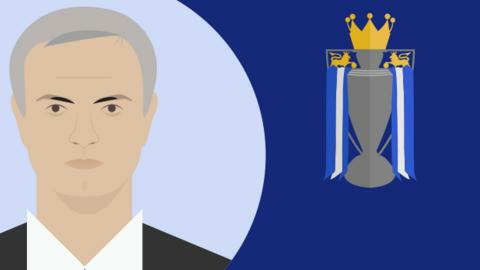 In guiding Chelsea to their fourth Premier League title, manager Jose Mourinho has secured the 22nd trophy of his career. Following his latest triumph, Mourinho now averages a trophy every 34 matches as a manager. Since taking charge of Porto in 2002, the self-proclaimed 'Special One' has swept all before him - both domestically and in European competition. While still well behind Sir Alex Ferguson's record of 13 Premier League titles, the range of silverware in Mourinho's trophy cabinet is no less impressive. The Chelsea boss has won the league in four different countries, lifted the European Cup with two clubs, won a Uefa Cup, an FA Cup and three League Cups, as well as securing an array of domestic cups in Portugal, Italy and Spain. Combining his two spells in England, Mourinho's win percentage is better than any manager in Premier League history. He has won 135 of 193 Premier League games in charge of the London club, which comes to a win percentage rate of 70%. Under Mourinho, Chelsea have lost fewer than one in 10 league games. - The data is correct up until 15:30 BST 3 May 2015. Chelsea's victory at Anfield last season to halt Liverpool's march to the title was just one of the eight wins Mourinho has notched up against the Merseyside club in the Premier League. The Chelsea manager has enjoyed more success against Liverpool than any other club in the league, losing just once in 10 games. Mourinho's record against his title rivals is what sets him apart from the opposition. Out of 40 league games against Liverpool, Manchester United, Manchester City and Arsenal, Mourinho has lost just three times. While the Portuguese manager enjoys an impressive record against sides challenging for the title, surprisingly he has not fared as well against clubs from the north east. Newcastle United are the only team to have defeated Mourinho's Chelsea three times and just one of two sides to have taken all three points from them this season. Middlesbrough beat the Blues twice in 2006, while Aston Villa and Tottenham are the other two teams to have taken maximum points from Mourinho on more than one occasion. Arsene Wenger's failure to beat Mourinho has received plenty of attention recently, but Arsenal are certainly not the only Premier League side to have struggled against the Chelsea boss. The Gunners are just one of 19 clubs that have not recorded a single victory against the Special One. Of the 19 teams Mourinho has not lost to in the league as Chelsea boss, he has a 100% record against eight. This includes seven wins out of seven against Portsmouth, who were in the Premier League during Mourinho's first spell in charge. The Portuguese manager has tasted victory against every team he has played in the Premier League and lost just once against nine clubs, including the losses to Liverpool, Manchester United and Manchester City mentioned above. Of these defeats, all but one has come away from home. The only loss Mourinho has suffered at Stamford Bridge in the league came in a 2-1 defeat by Sunderland last season.